Derby County have enjoyed a great week so far. Prior to Saturday I heard many supporters discussing the then up and coming games with Sheffield United, West Bromwich and Middlesbrough. They were hoping for five points from the trio. Well, with two of those games now played, we have six points! Sheffield United at home was a real game of two halves. An entertaining affair with the Rams scoring seconds after the kick off, the Blades then dominated the rest of the half before equalising just before half time. Derby then took charge of the second half and snatched a winner, the game being a very good advert for second tier football. Last night we made the trip to The Hawthorns to face Darren Moore’s impressive West Bromwich Albion. They had been scoring plenty of goals and their defence was doing a good enough job too. 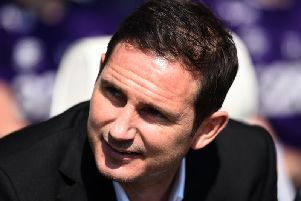 What has been interesting is Frank Lampard developing a style of play and it evolving into good exciting, attacking football. He makes changes when he feels things need freshening up and now knows exactly which players have certain qualities so he can prepare for games. There’s no changing for the sake of it. We visit Middlesbrough on Saturday who have a style similar to what we saw last season under Gary Rowett. Not greatly exciting, but they sit above us in the table. This game will be a very good test for us. Can we beat the negative style of Tony Pulis? Can we take the game to them and come away with a win? There are many questions ahead of our trip to The Riverside Stadium, but it will be a good pointer as to whether we have developed into a side that can deal with all styles of play. We fell short at Millwall and Bolton so a result on Saturday could indicate much learned over the weeks. A big shout out must go to Jack Marriott. I previously said he will be looking to make the striker's role his own prior to Saturday and he gone on to score in our last couple of games. He has also put in two very good shifts. He’s looking like a natural predator and reminds me of a certain Bobby Davison from years gone by. Barry Fry of Peterborough stated that Marriott was a better striker than another former Posh player, Britt Assombalonga. Saturday will give him a chance to back up the claim as the Assombalonga is first choice striker for our hosts.